In today's scenario when companies are dependent on IT as their primary source of shaping the business, it is increasingly becoming challenging for them to get more done from IT in less time. While, IT has been traditionally looking at stability of production as their first priority, business has been looking at leveraging IT to deliver innovative features that can exceed the needs of their customers. In the journey of balancing the agility and stability of IT, DevOps principles play a vital role and it is now being sought after by development & operations team alike to build better collaboration reducing the time-to-market. We recommend DevOps qualification to anyone who has ever worked in IT development (applications or infrastructure) or operations OR are currently managing these areas. The workshop is highly important for people who are looking delivering technical/business benefits such as continuous integration, continuous delivery, faster delivery of features while maintaining production stability as well as breaking- down barriers and reducing cycle times. None, although it is advised to have know-how of ITSM or management/implementation of development streams (application/infrastructure). Innate Labs is a pioneer in learning and consulting domain and is a preferred service provider for leading MNCs and corporates across the globe. Innate Labs has been delivering consulting development projects on DevOps principles since a decade and has been considered as a authority in this domain when it comes to implementation. Innate Labs has built the principles into a curriculum providing hands-on experience on the DevOps topics delivered through our SMEs ensuring 100% learning assimilation. The DevOps credentials are valued only if you have hands-on practical experience and Innate Labs is committed to providing you the un-matched experience. Our trainers are Industry Experts/Implementors and are regarded as the authority in the DevOps domain who have 15+ years of practical implementation experience working in all the phases of application development and operations for global MNCs and have played several roles in the management ladder. It is this experience that enables our delegates to gain the right practical knowledge coupled with the best practice standards helping them to achieve their career aspirations in our training and certification sessions. DevOps is all about building better collaboration (technological & human). DevOps is an ideology rather than a technology or methodology. There is no governing body who owns the principles and like Lean SixSigma principles, it is the content delivery & implementation experience sharing that matters the most in such qualifications/certifications. Innate Labs has built and pioneered the certification program which is now widely adopted in different arenas under different structures. 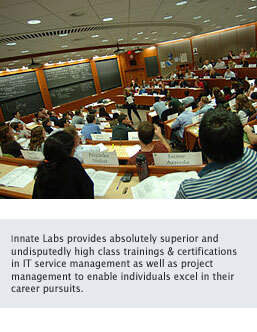 The InnateLabs DevOps certification program is structured into three parts, i.e. DevOps Preliminary, DevOps Intermediate & DevOps Expert. Preliminary certification is mandatory for the intermediate & expert paths. While the preliminary level is focused on providing the know-how around the concepts as well as the cultural challenges & sets the foundations, the intermediate & Expert levels are focused on the implementation aspects of DevOps using industry leading toolsets e.g. Atlassian Jira, Confluence, Bamboo, Puppet, Jenkins, Ansible, Chef, Salt, Nagios etc. The Preliminary is the most sought after in the management domains where project / service managers are expected to drive the culture of collaboration through implementation of DevOps principles. The Intermediate & Expert paths are more hands-on in nature and are focused on technical leads/managers or senior technical profiles who are more inclined towards the implementation. Specially built scenarios and comprehensive sets of related tasks help provide a practical application of the DevOps principles. The DevOps training class sizes are limited. The DevOps training and certification course includes work-based practical activities and discussions as well as sample questions.